Jean-Michel Frank was the French architect who with his creations, especially those made in the ten years from 1930 to 1940, completely turned round the world of the decorative arts. While working in Paris, his own city, and also in New York and South America, Frank was inspired by Neo-classicism and by the abstraction of primitive art, bringing to his age a completely original style with an elegance that met with wide approval among a rich and élite clientele. His name has thus become a byword for many collectors of furnishings from the last century. The decorating principles he developed are the corner stone of a minimalist style still very much in vogue in interior design and increasingly used in settings which aspire to absolute elegance with a sober, functional atmosphere. 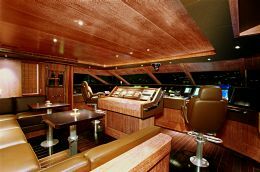 This type of decor also inspired the architects who designed the interior of the Akhir 140, the largest motoryacht ever built by the Cantieri di Pisa. 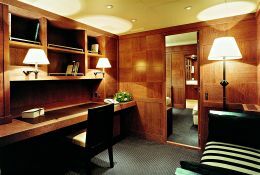 The latter is a work group composed of the shipyard's design office and Frédéric Mechiche, the interior designer empowered by the shipowner himself. 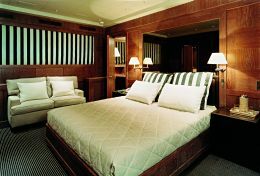 Each setting has been made as bright as possible by the tones - never too dark - of the wood used for the furniture. 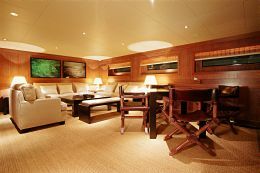 Wide use has been made of sanded teak, for example, sometimes contrasted with darker elements, such as the tables in the dining and living area in black-dyed pear, or the inside handrails and the floors in some areas such as the lobby in the main deck and the wheelhouse, all black but still in teak. Frédéric Mechiche has also decided to use travertine in the bathrooms both for the floors and for the sinks, while the shower cabins have been embellished by mosaic tiles, again in natural travertine. The work of the designer's team, however, has not been limited to the furnishing materials but includes all the aspects characterising and constituting the interior of the hull, from equipment to the furnishing accessories, from upholstery to the type of lighting used in each area. For example, while on the subject of bathrooms all the taps and fittings are German-made from the Tara line produced by Dronbracht; all the small spotlights installed in the ceiling were custom made to a design by the shipyard, both for purely aesthetic reasons and to create the right balance between artificial and natural light; the switches, sleek and reliable, are by the French company Meljac; the floor of the two lounges is laid with a lath woven with algae and edged by linen and hemp; upholstery is exclusively in natural fibres such as pure linen and silk while for curtains the choice fell on raffia, adopted in the lounge, and on cotton for the cabins; the lighting panels of the ceiling, as well as those of the bedside cabinets and the tables of the two double guest staterooms are in leather. 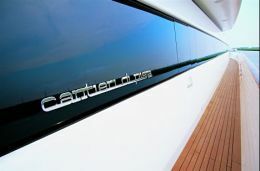 These are only some of the aspects which characterise and enhance this new flagship which, incidentally, is also the first boat developed on three decks ever built by the Cantieri di Pisa. Let's begin our discovery of this superyacht on the lower deck where care has been taken during the design stage to take advantage of the spacious hull; the result is a layout which includes as many as five delightful cabins for guests. 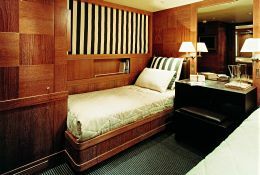 Two of these, towards the stern, have double beds, another two, mid-ship, have twin beds, while the fifth, forward, is a sumptuous VIP bedroom which is particularly spacious and covers the entire width of the hull. Each of these rooms has its own bathroom which is similar in terms of both size and decor. The owner's suite, on the other hand, is forward of the main deck, fully exploiting the width allowed by the bridge house in that area. The private bathroom is also large with a central Jacuzzi tub dividing the room into two identical areas, each one with its own sanitary fittings. 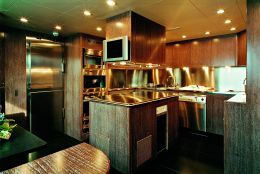 Completing the layout of the main deck is the galley and a large lounge, divided into dining and living spaces, the latter ideally adjacent to the cockpit. 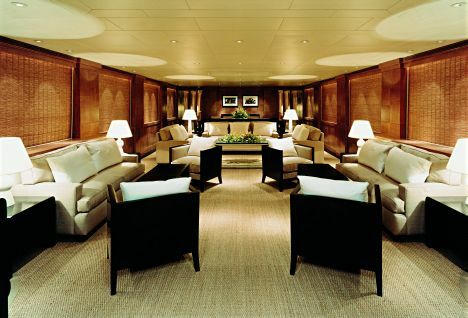 A second lounge, which could be defined as panoramic, takes up most of the third deck, leaving, however, enough space both for the captain's quarters and the cockpit from where the boat is steered. 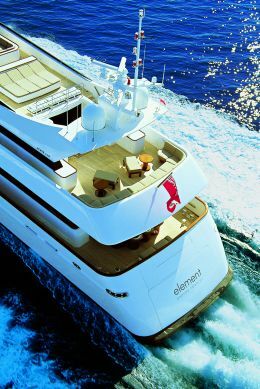 Still higher is the sun deck which is a large area entirely given over to sunbathing and to relaxing in general. 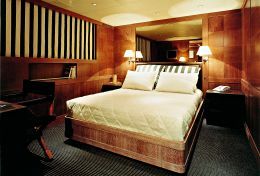 As regards the crew's quarters, these are situated at the bow end of the lower deck and comprise four cabins, a comfortable dinette and kitchenette as well as a technical area which includes the laundry. As regards the exterior, on the other hand, built by the yard while maintaining that unmistakable "family feeling", special mention should go to a roomy garage astern, containing the tender and the related loading crane, whose door, when open, becomes a large bathing platform which is perfectly accessible from the main deck by two ladders, one inside and the other outside. Finally we come to performance: the power of two MTU 16V4000 engines, each one 3,700 HP, enables this powerful Akhir 140 Element to reach a maximum speed of 28 knots, cruising speed 25 knots, guaranteeing a range of at least 2,000 miles at a speed of 12 knots.